Mars Lander May Be Missing, But A Second Spacecraft Is Still Humming Along : The Two-Way As scientists try to figure out what happened to the Schiaparelli lander, which may have crash-landed, a craft known as the Trace Gas Orbiter is orbiting the red planet in search of signs of life. 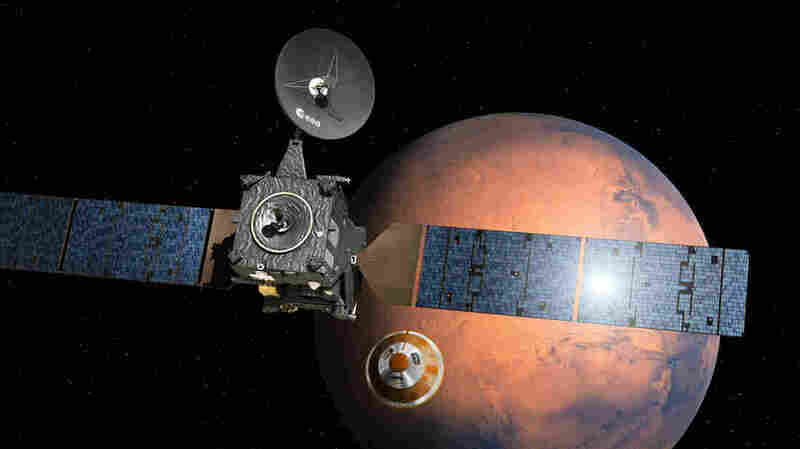 Artist's depiction shows the separation of the Schiaparelli lander from the Trace Gas Orbiter (left) as it heads for the surface of Mars. The Schiaparelli Mars lander got very close to the red planet before something went wrong. It entered the planet's atmosphere, managed not to burn up as it hurtled down and unfurled its parachute. It's unclear what happened in the final minute of descent, but it wasn't what the European and Russian space agencies had planned. Scientists working on the ExoMars mission say the lander let go of its parachute early. Then, the thrusters that were supposed to help slow its descent — from a crazy-fast speed of 13,000 mph to 0 mph in just six minutes — appear to have turned off too soon. The scientists are still sifting through data from sensors on the lander to try to figure out what happened. But they aren't totally distraught, because there was a second spacecraft involved in the mission and it's doing just fine. In fact, the Trace Gas Orbiter is ready to collect information that could help answer a long-standing mystery about Mars: What is spitting out methane on the planet? There are two main options: either it's some chemical reaction happening underground or it's a sign of something that is — or was — alive. On Earth, microbes emit methane. Think cow farts. In goes grass, out comes methane, thanks to microbes that sit in the animals' guts and help them digest. These days, Mars is barren, dry and exposed to harsh radiation. But about 3.5 billion years ago, the planet used to be a lot warmer and wetter, like the young planet Earth. Any methane that makes it to Mars' surface would get obliterated by ultraviolet light after a few hundred years. But a few years ago, astronomers looking at infrared images found that methane was released from certain locations on the planet, and that it mostly happened during the warm summer months. In 2013, NASA's Curiosity rover also detected bursts of methane. So, scientists reason, something is actively releasing methane. It could be some chemical reaction happening underground — like water reacting with a certain kind of rock, or an underground volcanic process. But it could also be a sign of microbes that lived, or live, deep underground. "The TGO is now ready for science," said Jan Woerner, director general of the European Space Agency. "We are now in full control of the spacecraft." If all goes as planned, the orbiter will also relay messages during the second piece of the ExoMars mission, a plan to send a rover to Mars in 2020.